Do Not Even Think of It! 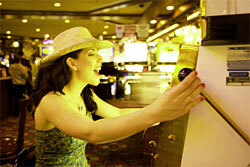 Playing tricks with slot machines and online and land casinos will lead to nothing but troubles. Either the violator will be banned from a casino or seriously punished for going beyond the law. There are plenty of stories about attempts to beat slot machines with the help of fraud. It must be noted that it is impossible to cheat modern slot machines as they are based on RNG and maintain upgraded security systems. There is one simple truth: casinos keep track of big winners. Even in case a gamer somehow affected a machine's payout, s/he has a small chance to escape with it from the casino. Well let’s assume that s/he managed to do a vanishing act once, but it is evident that it won’t work out once again. If you want to win big, you’d better practice own skills, use clever bankroll management system, keep your head cool and win money legally. Otherwise, you risk of having serious problems with the law. The only possible advice here is to gamble a clean game, obey the rules of the casino and enjoy the slots game to the full extent. Once upon a time there was a man named Tommy Glenn Carmichael. He is known as the most lucky slot machine cheater in the entire slot evolution. This man invented a device that was named “top-bottom joint”. After few bad shots he was finally caught and imprisoned. It is interesting to note that after the release he started it all over. In the meantime slot machines became more sophisticated and upgraded. And again evil genius Tommy Glenn Carmichael set the law at defiance and took a dare. And succeeded. This device referred to as a “monkey paw” or “slider” was injected into the slot machine and affected the slots payout mechanism. Eventually he was caught by police and sentenced. Nowadays Tommy is involved in working out anti-cheating technologies that will help to prevent casinos from any potential fraud and tricks. Below you will come across some methods used by “casino raiders”. Do you remember the old proverb: “A lie begets a lie”? Never tread in cheater’s steps and never violate the regulations established by a casino. Mini lights that are used to confuse gambling machine’s sensors. Counterfeit coins can easily be detected by modern currency detectors that verify the cash inserted into the machine. A range of mechanical devices that are placed near the payout mechanism with the aim to mislead it and alter the payout amount.